Survivor: South Pacific (2011) - 12th out, 7th place - 6th juror. 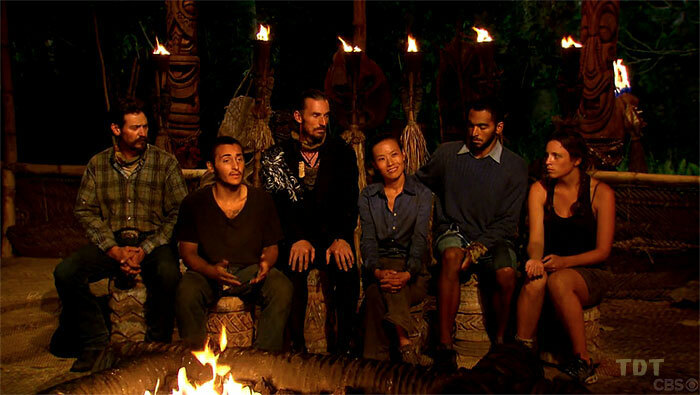 Voted out in Episode 12, "Ticking Time Bomb" (Day 30). 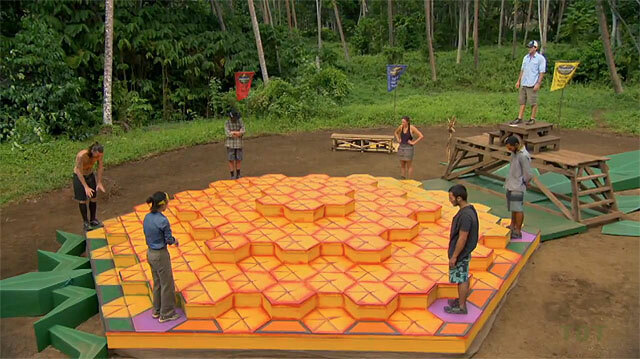 Eliminated by Ozzy Lusth (in a duel) in Episode 13, "Then There Were Five" (Day 31). Longevity totals: In-game - 30 days; Redemption Island - 1 day. South Pacific Ep. 1 IC: "Coconut Conundrum"- Mostly watches, Upolu wins. South Pacific Ep. 2 RC/IC: "Crate Escape" - Sits out, as Upolu loses. South Pacific Ep. 3 RC/IC: "Hitching A Ride" - Works the final banner puzzle with Coach, and Upolu wins. South Pacific Ep. 4 RC/IC: "Shoulder the Load" - Loader for Upolu, but Upolu loses. South Pacific Ep. 6 RC/IC: "Losing Face" - Sits out, and Upolu loses again. South Pacific Ep. 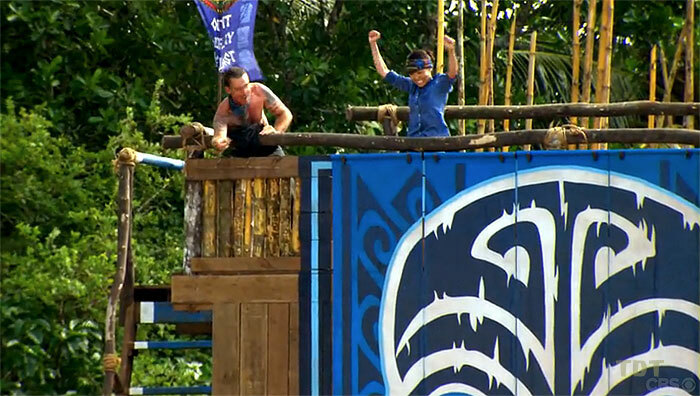 7 RC/IC: "Family Ties"- Paired with Brandon, retrieves a bag, and Upolu wins. South Pacific Ep. 8 IC: "Coconut Cradle" - First person to drop out, in the first round (4th/4). South Pacific Ep. 10 F8 IC: "C.A.T." - With Rick and Albert, eliminated on the first question (tie-6th/8). South Pacific Ep. 11 IC: "Second Chance" - Tied with Brandon for last place in the first round (tie-6th/7). South Pacific Ep. 12 IC: "Flip Out" - Final person eliminated, by Coach (2nd/6). South Pacific Ep. 13 duel: "Block It Out" - Loses to Ozzy (2nd/2). South Pacific, Ep. 6: Mikayla Wingle (voted out, 4-3). South Pacific, Ep. 2: One vote, from Christine. South Pacific, Ep. 4: One vote, from Stacey. South Pacific, Ep. 6: Three votes, from Sophie, Albert, and Mikayla. South Pacific, Ep. 9 (F10 vote): Three votes, from Whitney, Dawn, and Jim. South Pacific, Ep. 10 (F9 vote): Three votes, from Whitney and Dawn. South Pacific, Ep. 13: Five votes, from Sophie, Coach, Albert, Rick, and Brandon (voted out, 5-1). South Pacific, Ep. 14: Voted for Coach Wade, who finished second (6-3-0). Gordon Holmes at XfinityTV.com (8/22/11): "Pre-Game Interview: Edna Ma"
Gordon Holmes at XfinityTV.com (12/15/11): "Castaway Interview: Edna Ma"
Daniel Fienberg at HitFix.com (12/17/11): "Edna Ma talks Survivor: South Pacific"
SurvivorOz podcast interview (2/3/12): "Edna Ma interview"
"Personal claim to fame: I was the first in my family to finish college. I subsequently went onto complete medical school and am board certified in anesthesiology. Why you think you will be the sole Survivor: I’m determined and I believe I can achieve anything I set my sights on. "